Curios and Dreams | Makeup and Beauty Product Reviews : Brush Brush! It has been a long time since I have written anything for oral care. We all know that it is advisable to brush twice daily right? But how many of us know the correct brushing technique? Everyday in the hospital, I get patients with badly eroded and abraded teeth. Wrong brushing direction, improper force and the wrong technique used over a long period of time does more harm to our teeth than good. 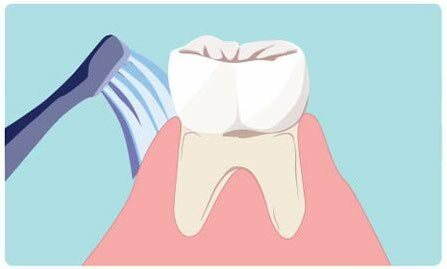 The whole brushing up and down and sideways as we usually do causes tooth abrasion over the years, leading to further problems like hypersensitivity. There are several techniques that may be used when brushing your teeth depending on the status of your oral cavity. However, studies have shown that the most popular and by far the most effective technique is the Modified Bass Technique. 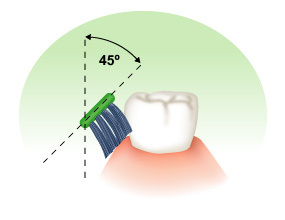 The key in this technique is to make sure that your toothbrush bristles are angled at 45 degrees towards the area where the tooth meets the gum line. Move the brush back and forth, using short vibratory strokes. (The tips of the bristles should stay in one place, but the head of the brush should wiggle back and forth). You also can make tiny circles with the brush. Do this for about 10 strokes/vibrations or 10 circles. (In healthy gums, this type of brushing should cause no pain. If it hurts, brush more gently). Flick the brush so that the bristles move out from under the gum toward the biting edge of the tooth. This helps move the plaque out from under the gum line. 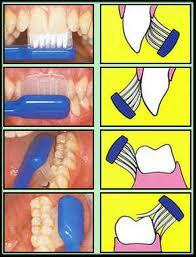 Divide the teeth into groups of 3 while brushing. Finish one group and move on to the next. Do not forget to brush your tongue. So many people don’t do this! It’s not a self cleansing tongue people… who would want a thick yellow plaque coating?! Ewww! Brush firmly but gently from back to front. (Don’t gag yourself though.... just go as far as you can comfortably). The most important thing you can do is to brush and floss your teeth each day. Just because you are brushing your teeth doesn't necessarily mean that you are doing an effective job. Be sure to use the proper technique to ensure that you remove as much plaque, bacteria, and food debris as much as possible.